I’ve been trying to cut down on the amount of wheat based products we eat in my family. This isn’t easy as wheat, in some form or another seems to be a part of most meals. As a halfway compromise, I picked up a box of Weight Watchers Oat & Wheat crackers. 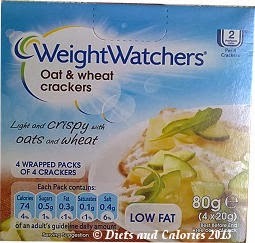 They’re low in calories, fat and sugar and are described as ‘Light and crispy with oats and wheat’. One single cracker has only 18.5 calories. Inside each 80g box are four individually wrapped packs containing four crackers (4 x 20g). At first glance they look just like Jacobs Cream Crackers, but upon inspecting them closer, these are a lot thinner. In fact, they’re almost like a wafer. I wouldn’t recommend eating them without any kind of topping as they’re extremely dry and quite tasteless. They crumble and flake a fair amount when eating them too. However, they hold together reasonably well when spreading with a topping. 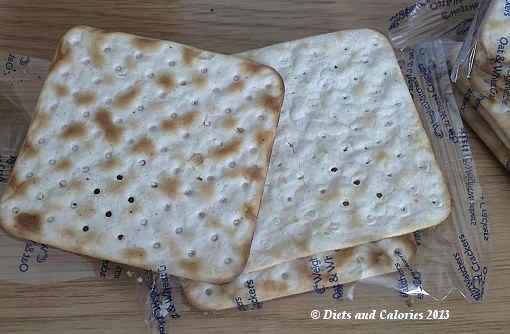 Personally, I won’t be buying these again as I like my crackers to have more flavour and texture. 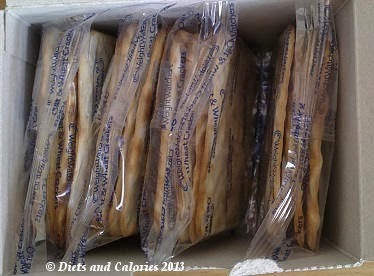 But they’re a good option for calorie counters as you can eat the whole pack for only 74 calories not counting toppings. The only ingredients are wheat flour, oat flour and salt, but it doesn’t specify the percentages of wheat and oats. The amount of salt is unfortunately in the high traffic light region. Available in Poundland and various supermarkets. Nutrition Information per 4 crackers: 4 ProPoints, 74 calories, 1.8g protein, 15.6g carbs, 0.5g sugars, 0.3g fat, 0.1g saturates, 0.6g fibre, 0.4g salt. Suitable for vegetarians.